Sen. Rand Paul is prepared to vote “no” on the Senate GOP budget if leaders do not agree to cut billions in spending from the plan, he said in an interview Tuesday, reports Politico. Rand said he wants to get rid of the $43 billion in overseas war funding that exceeds federal budget caps Congress agreed to in 2011.
the $43 billion in overseas war funding that exceeds federal budget caps Congress agreed to in 2011. On a conference call with reporters Tuesday, he suggested his Republican colleagues are “hypocrites” who are only parading as conservatives. A lot more than $43 billion needs to be cut from the $4 trillion-plus budget, but at least Rand's thinking is in the right direction. That said, Senate Republicans appear to have enough votes to pass their budget even with Rand's "no" vote. Sen. Thad Cochran (R-Miss.) announced Tuesday that he has returned to Washington for votes; his absence would likely have meant the GOP could lose only one vote and still pass the budget. Meanwhile, Sen. John McCain of Arizona, another Republican thought to be a potential "no" vote, now tells reporters that he would support the GOP budget measure. 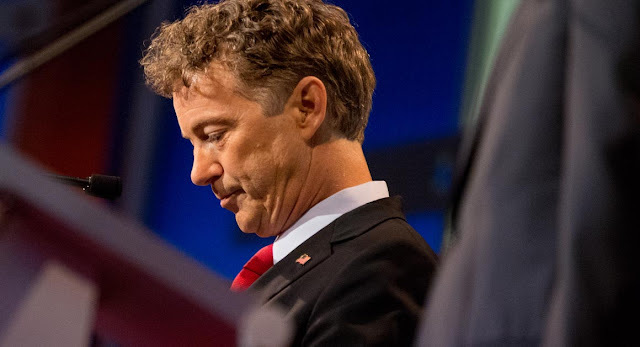 Has Rand Paul found a framing expert or did he pick up the skill along the way? He says he is a yes if we agree to the current rules and a no if the powers that be exceed the agreed upon spending caps. I give this a score of: Very persuasive. That McCain is such a maverick.